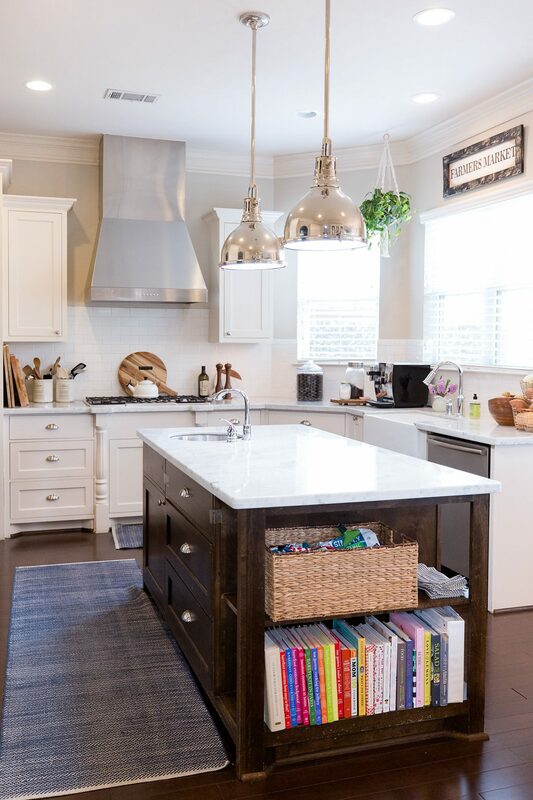 If you’ve been here before, you probably know how much I like to keep things clean and organized in my home. I don’t do it alone though, my favorite person, Anna, comes every Friday to help clean and that’s a benefit I don’t take for granted! I often clean and organize alongside her, but, even with her, I’m always amazed at how quickly we dirty everything up each week! I recently stumbled upon a new YouTube channel, How Jen Does It, which is all about cleaning and organizing and meal planning and I’ve been hooked! Sometimes I’ll read or watch videos before bed to unwind, and the first night I watched her video I was having trouble sleeping. Seeing her clean her home and talk about her nightly routine actually prompted me to get out of bed at midnight and start cleaning and decluttering my house!! I don’t think I got to bed until 2:30 am, but I woke up to drawers cleaned out, several bags to donate, and a sparkling clean kitchen! 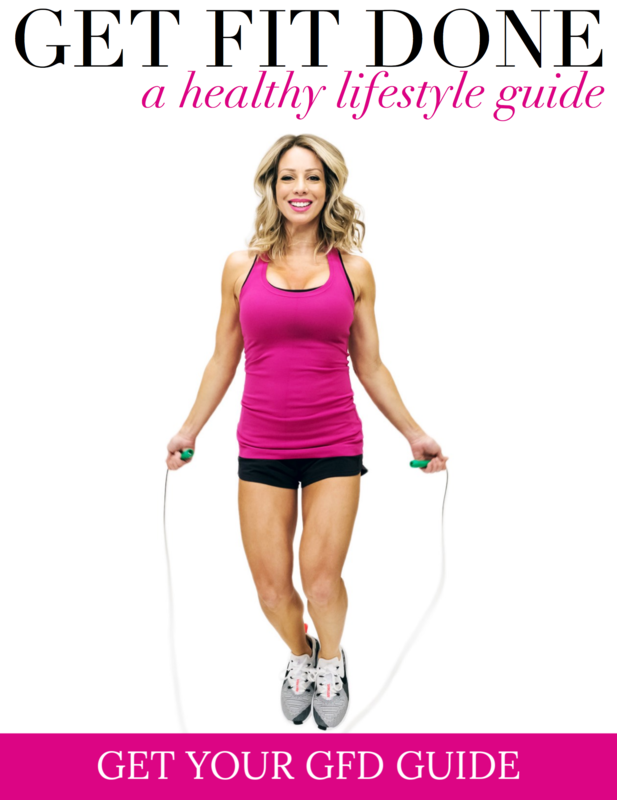 What I love about Jen is that her routines are super simple and easy to implement. She has a morning and evening cleaning routine and ever since I watched those videos I’ve been doing my own nightly cleaning routine religiously. Did you know there’s even a hashtag for that?! #cleankitchenatnight ha! 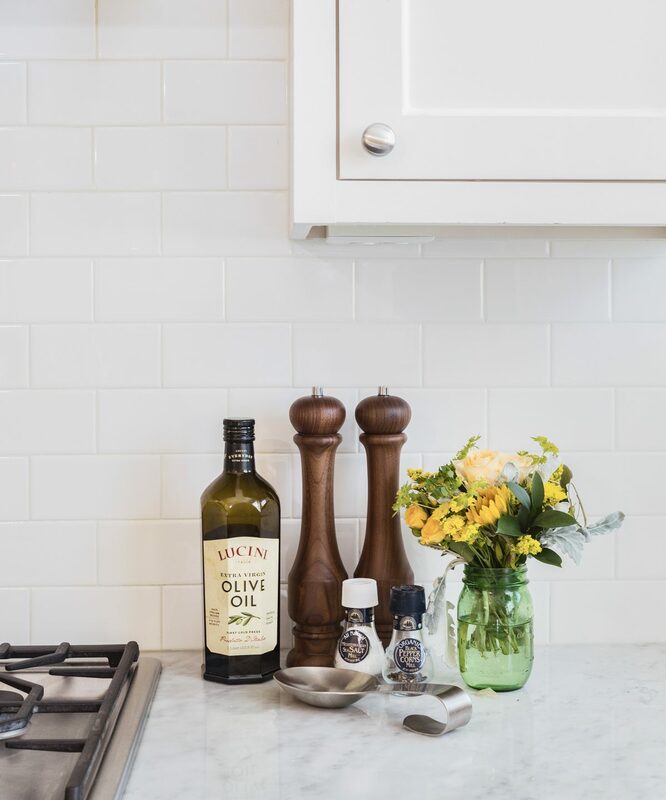 We usually keep our kitchen pretty clean, but we’ve been lax about letting dishes pile up in the sink or washing by hand and then leaving the dishes out drying on the counter. This #cleankitchenatnight takes it a step further. Every night after dinner all of the dishes are put into the dishwasher, the sinks and counters wiped completely clean, and the floor is vacuumed. 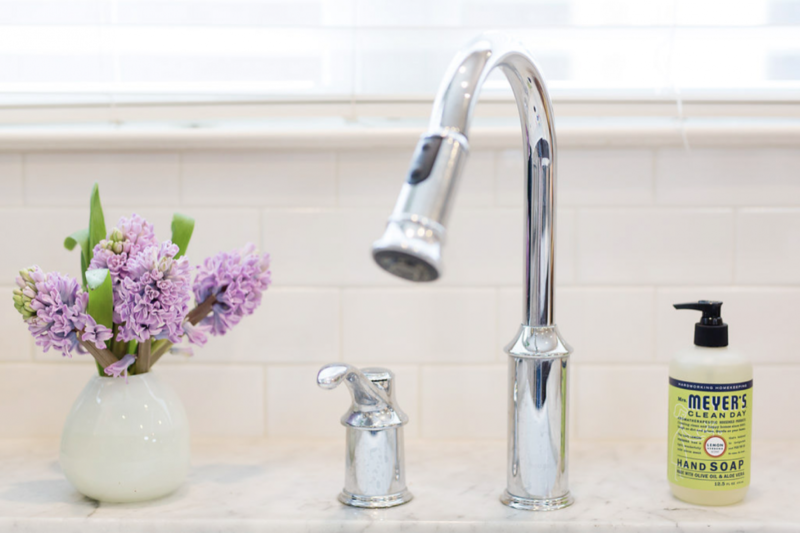 I recently mentioned on Stories that I used to clean my kitchen sink with Barkeepers Friend because it gets the sinks shiny clean, but, I always felt like that product was so toxic and harmful to our family. 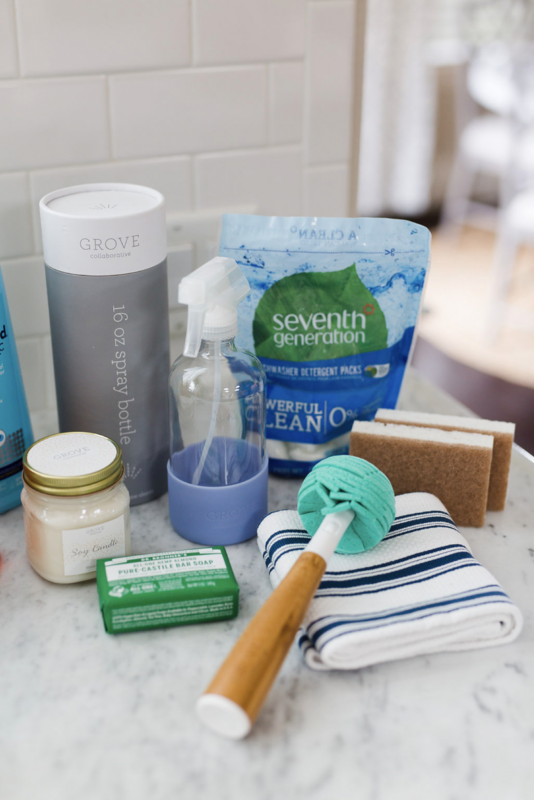 My friend Courtney introduced me to Grove Collaborative, an online retailer with safe and sustainable cleaning products that you can set up on a flexible recurring shipment schedule. I got in touch with Grove and they sent over a sample of the cleaning products to try. You guys, I absolutely love them! Grove hand-selects natural products that really work and deliver them right to your doorstep, whenever you choose #lesstripstothestore. They carry brands like Method, Seventh Generation and Arm & Hammer, plus their own brand of cleaning products that are amazing!! It really makes cleaning better when you have quality products to use that are safe for your family, and also look and smell good! Even my 8 year-old likes to use it! And he should! He makes most of the mess! This is such a game changer when you wake up in the morning and walk into a spotlessly clean kitchen! A couple days lately I have woken up late and felt kind of a mess, but when I went into the kitchen and it was all clean, I instantly felt a little bit better and ahead of the game! Having the kitchen all clean in the morning has also helped me keep it clean throughout the day and while I’m cooking. I’m a notoriously messy cook, but I have been able to keep everything clean while cooking- because the kitchen is clean to begin with! Do you go to bed with your kitchen all clean at night? 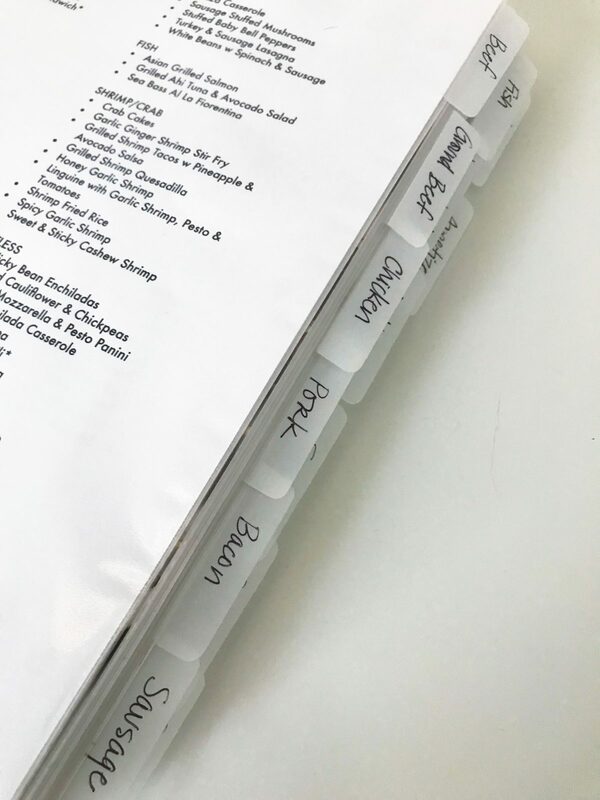 So, speaking of cooking, last weekend I shared my recipe binder on Stories and had so many questions about it! You can see the video on my Instagram highlights, but I’m going to share it again here for easy reference. My 10 year-old binder is just a plain white three-ring binder and I tore out a magazine article that resonated with me to put in the front cover. I recently updated it with a reorganized format and table of contents, again inspired by How Jen Does It. To start, I pulled out all the recipes, discarded the ones we never use, don’t like or I didn’t even know what they were, and started with our tried and true and went about searching for a few more! 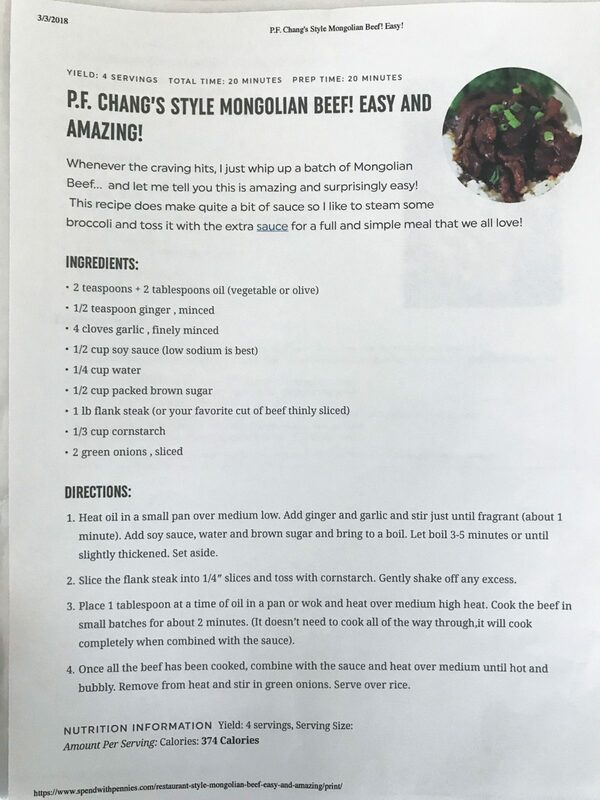 Then, I kind of created a Table of Contents, which is my recipes organized by category, like Beef, Ground Beef, Chicken, Meatless, Etc. so I could easily find a meal when we had chicken in the fridge, for example. 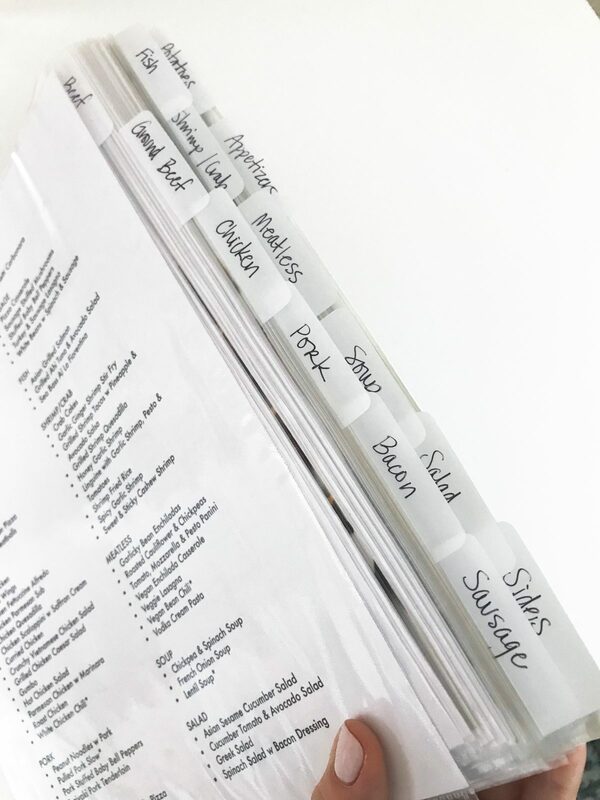 Lots of recipes have more than one main ingredient, so it’s a judgement call on those as to where you put them in your binder. 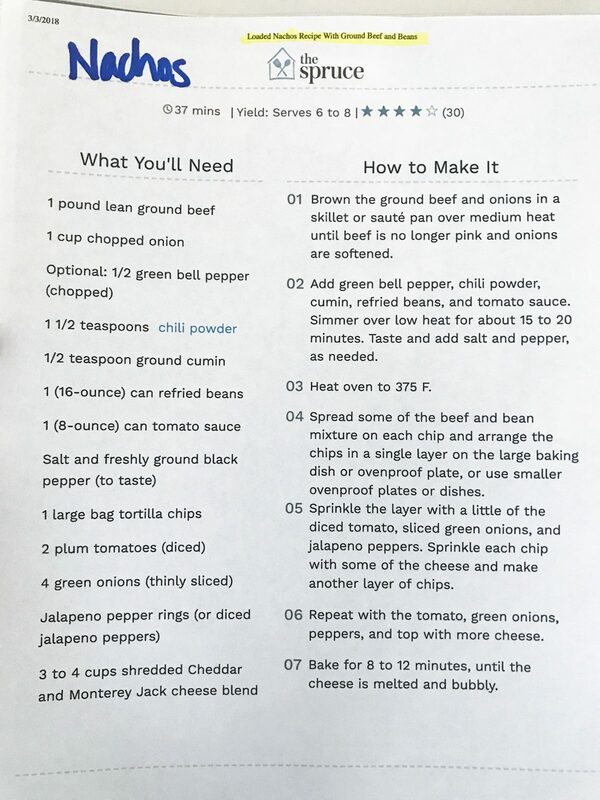 I listed each recipe alphabetically and put an asterisk next to the meals that were slow cooker. Before doing it this way, the recipes were organized by Dinner, Sides, Salads, Soup, etc. 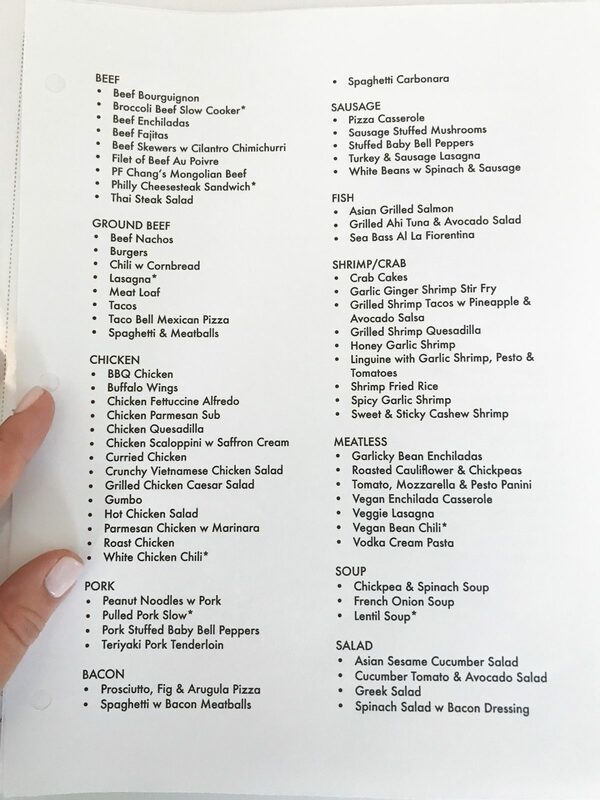 but there were so many dinners that it was hard to find one or know at at glance what was in there! Now I can see exactly what I have and can easily plan our weekly menu by choosing, for example, a beef recipe, chicken, fish and meatless. I only listed the snacks as reminders, I don’t have an actual recipe for those. And I can also see that I need more fish recipes! 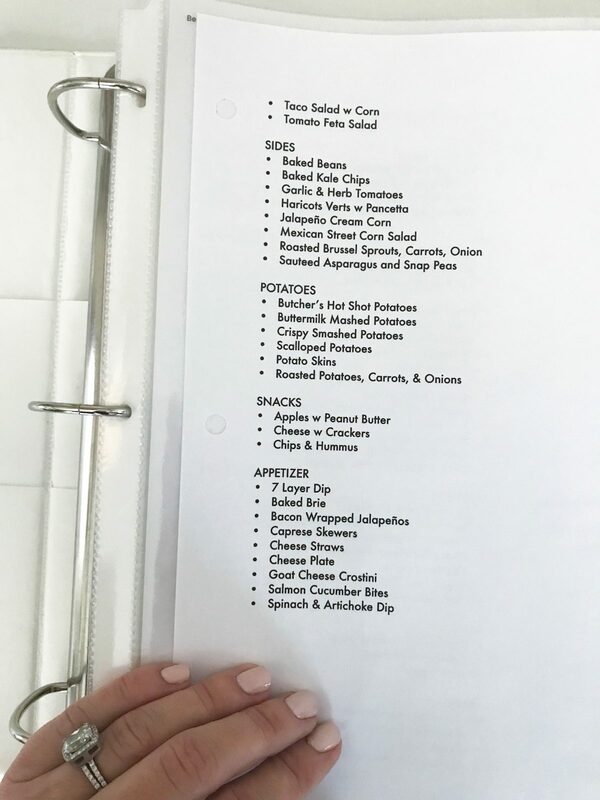 But, even though I pretty much ‘know’ how I make my nachos or chicken wings, or things like that, I still printed out recipes so that I could quickly see all the ingredients because it helps when planning your grocery list. I got the white tabs on Amazon and just wrote in the categories, but you could use a LabelMaker to print them. I found the sheet protectors at Target. 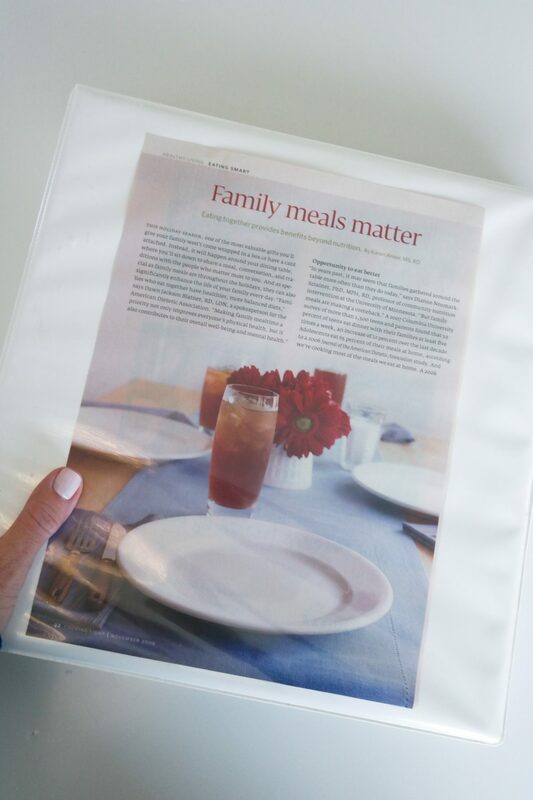 The recipes come from Internet print outs, magazine tear-outs and family recipes. 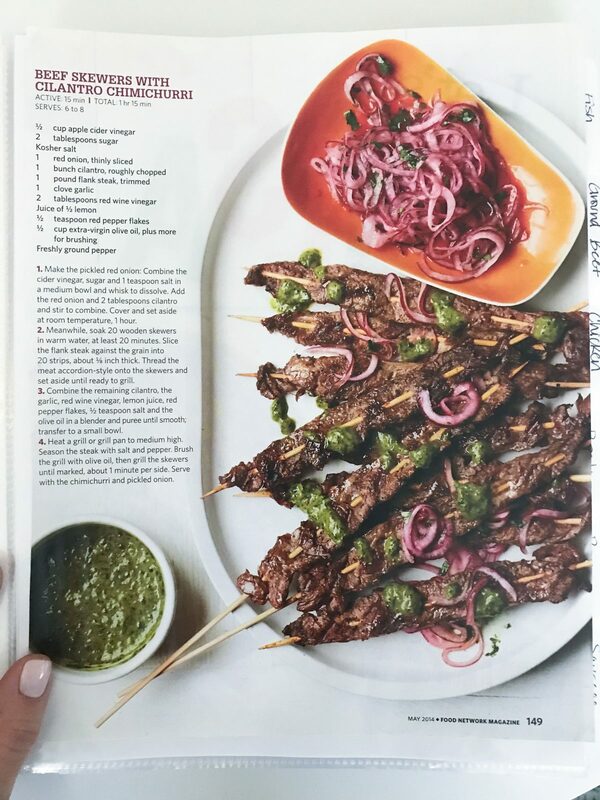 I put a new family favorite recipe in my weekly newsletter that goes out every Saturday morning, so if you’re interested in receiving that, subscribe here! 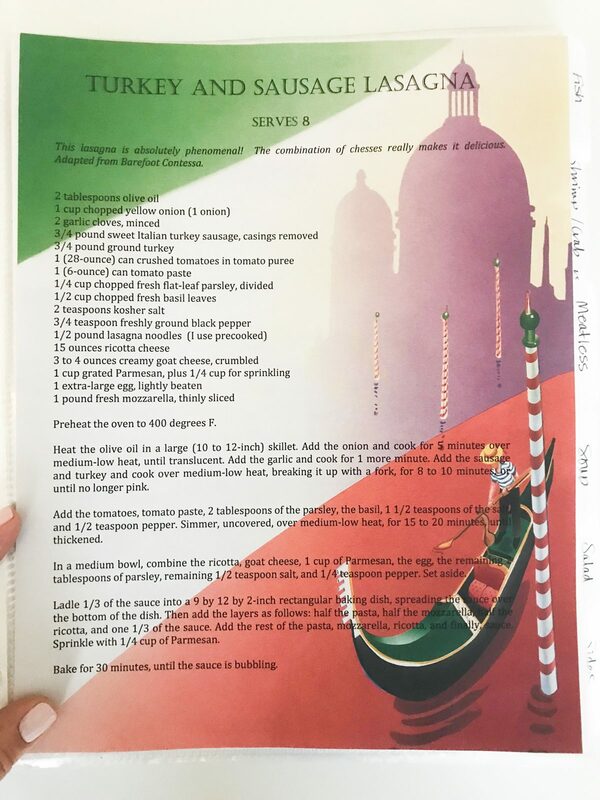 When I was newly married and clearly had too much time on my hands, I would buy specialty paper and print the recipes out. I can’t believe I took the time to do that?! Ain’t nobody got time for that now! Ha! This has been such a life changer when making my weekly meal plan. 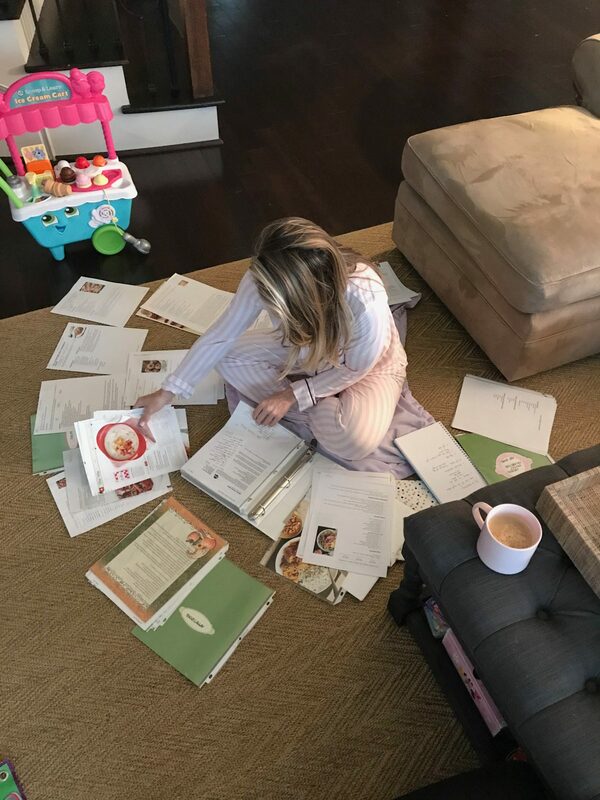 I will use the recipes to make my grocery list and then pull out each recipe, keeping it in the sheet protector, so it doesn’t get messed up while I’m cooking. 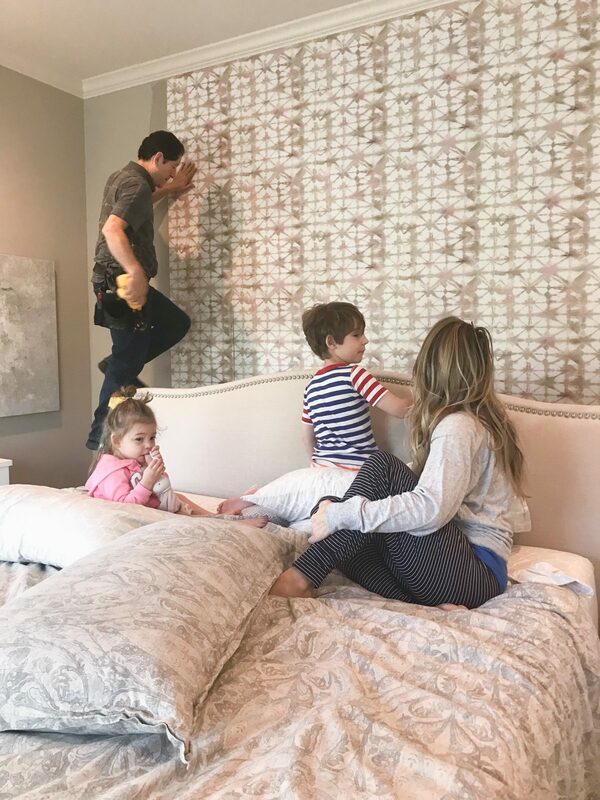 I wanted to get you caught up on our master bedroom makeover! If you recall, in February, I shared the ‘before’ and our plans here, and now we’ve made some progress! The new nightstands and have arrived and the wallpaper has been installed! I’ve wanted to wallpaper the back wall forever but was having a hard time narrowing down all the wallpaper choices. 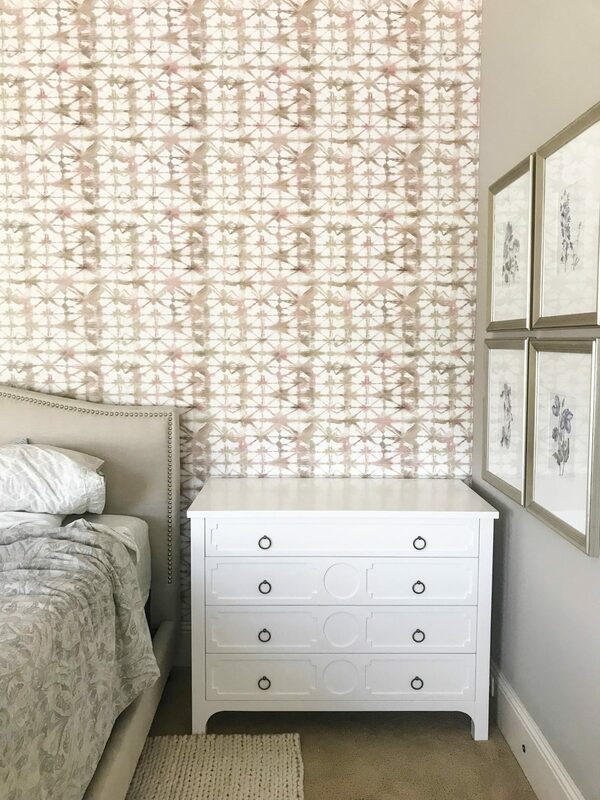 This wallpaper is the Logan Wallpaper from Anthropologie and I’m absolutely in love with it! I knew I wanted something abstract and I’m crazy for the mix of colors- tan, cream, and pink. The design reminds me of those ink blot tests, but in a pretty and feminine way! 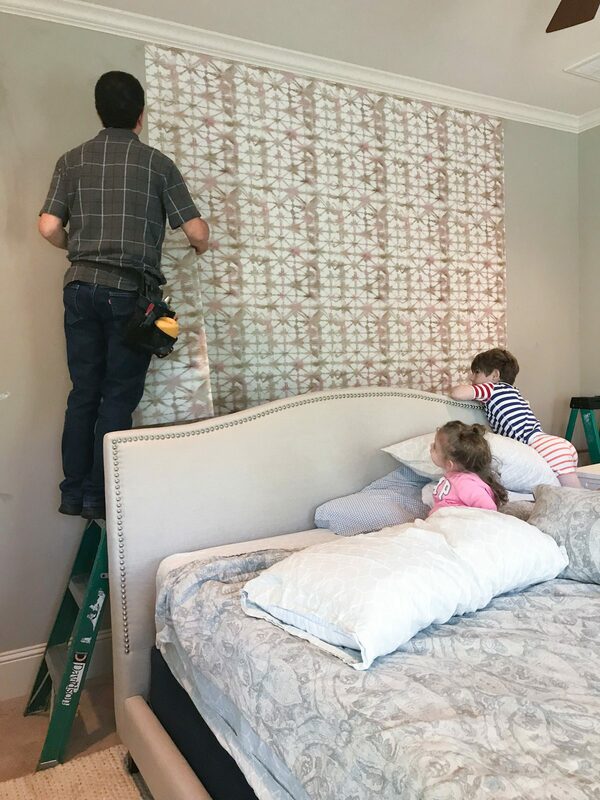 I hired professional wallpaper installers to hang it because I didn’t trust myself and I knew it would take me so long to do it. They were in and out in about an hour and did an amazing job! We have ‘orange peel’ texture on our walls and they scraped it off before they hung the paper. These guys had a captive audience! It was so funny because the nightstand delivery came right in the middle of the swimsuit try-on so I had to quickly cover up! You might have seen that on Stories! So funny the timing! I love the sleek simple design of the nightstands and the size. They fit the room perfectly and are exactly what I was looking for! And I happened to get them on a sale which was a big win because they are pricey! We’ll be getting a taller bed, new lamps and mirrors to go above the nightstands and new bedding, but so far I’m thrilled with how the wallpaper and nightstands turned out! 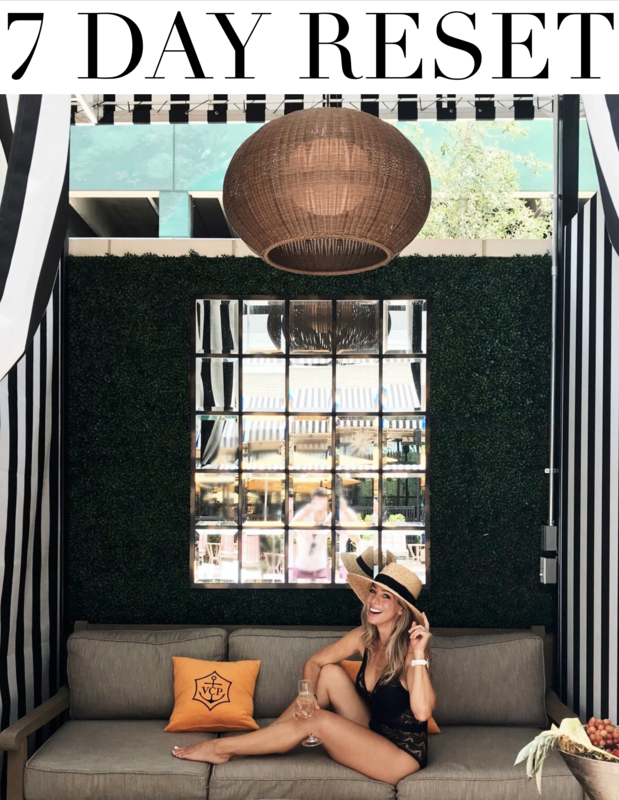 A few new things for Spring arrived after my last dressing room post, so I’m sharing them with you here! I got excited to lighten up the traditional blue jeans with a pretty pink pair and found these! I got excited to lighten up the traditional blue jeans with a pretty pink pair and found these! They are a nice pale shade of pink that isn’t too peachy or too pastel, kind of on the neutral side that will work with lots of top options. This brand is one of my budget friendly faves, and they are supposed to be ankle length, but of course on me, hit all the way to my ankle. Fit: They fit, TTS, I’m wearing my usual 25. I’m always on the lookout for a great pair of work pants because I clearly remember how rare they can be to find and how, when you do find a great pair, they are your BFF and you end up wearing them all the time! This ankle pant is slim fit pant that you can wear casually or dress up for a professional look. These felt good on, relaxed with a bit of stretch, and the ankle-grazing length shows off your shoes! Pants Fit: TTS, I’m wearing 0P. The blouse is on my list of must haves for the working women. Especially in Houston, I always needed a professional blouse that was short sleeve or sleeveless. 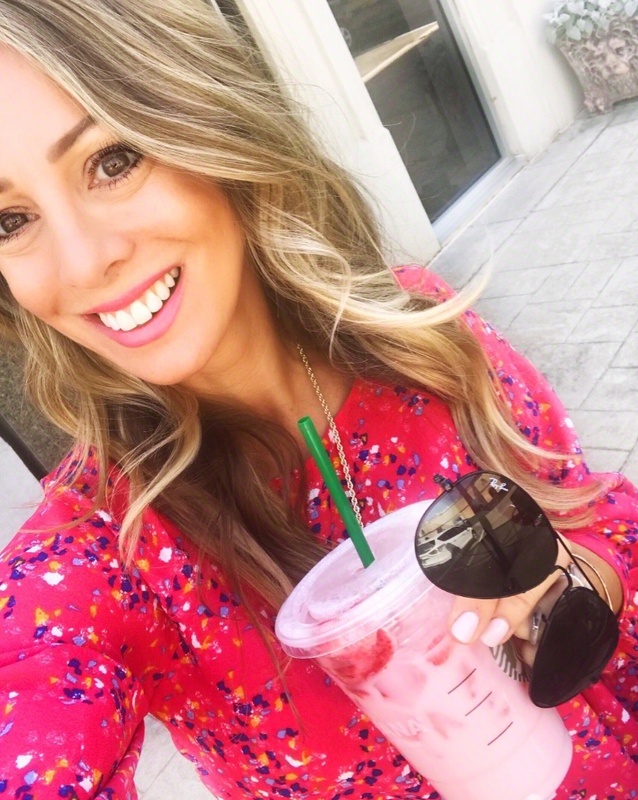 You can always throw a cardigan or blazer over this top indoors, but when I was running from office to office in the summer, I definitely wanted to shed that layer and still look polished. This top is satiny soft and comes in a rainbow of colors. It’s also machine wash and dryable! Blouse Fit: TTS, I’m wearing XSP. Shoes Fit: They run small, size up half. I like lounging around in a casual short, and this camo pair fits the comfy + cute bill to a T! They also aren’t too short on me, which is good if I want to take them out running around. I paired the shorts with the ultra comfy white tee from the Living in Yellow x Gibson collab. 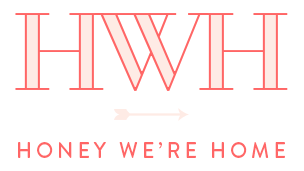 I shared a few more pieces from Erin’s last here if you want to check it out! I also found another great everyday tee-shirt for only $17! I dig raw edge v-neck and the curved shirttail hem. This one is comfy and casual and one you’ll want to buy in lots of colors! Fit: TTS, I’m wearing XS. Of course, y’all know about my fave jean shorts by now, and they’re already starting to get lots of use lately with our weather heating up. I wore mine so much last year, but they’ve really held up well, so I’m sure you’ll be seeing me in these a lot more this Spring and Summer. Jean Shorts Fit: These run big, I sized down from 25 to 24. I’m starting to realize it’s about that time to up my fitness game for summer and I’ll be trading in the cold weather workout gear for things I can wear when it’s hot out! This tank is stretchy and seamless with breathable mesh to keep you cool. It’s also on sale 40% off! It fits TTS, I wear XS. The shorts are a SUPER happy find! I love the fit, the style, the smooth wider waistband, and the built-in waist pocket for running with your car key! They are moisture wicking and are lined!! Basically, I hit the running shorts JACKPOT with these!! They fit TTS, I’m wearing XS. Okay guys, that’s a good place to stop for now! Hope you have a great day!! I have a white sink too and it’s so hard to keep clean! 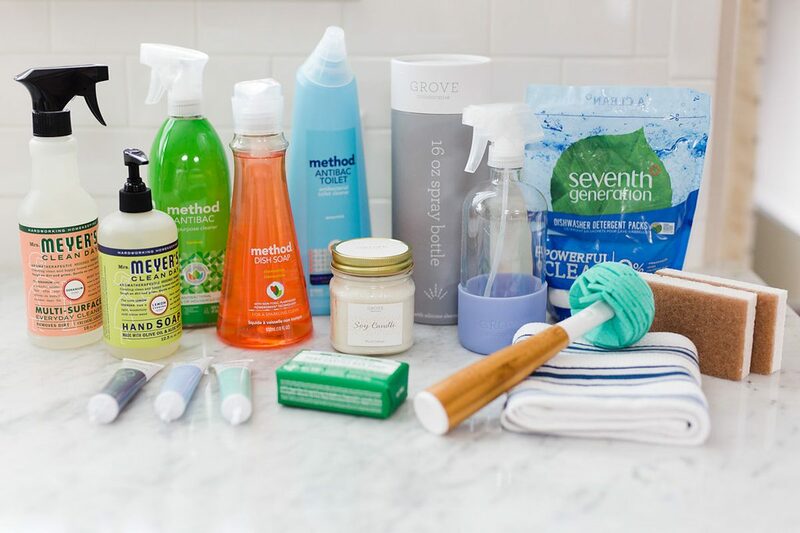 What product did you get from Grove to clean your sink at night? I have been using the All Purpose cleaner! And just the liquid dish soap! 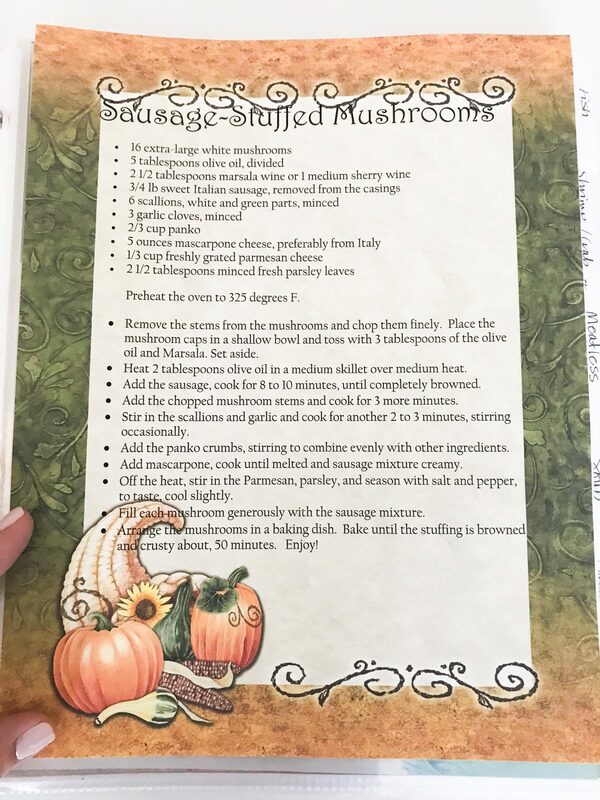 I love your recipe binder! I need to upgrade mine lol ! Now I’m on the hunt for more good recipes! Your Grove link isn’t working….or maybe it’s my PC? Not sure but love your blog and want to try Grove for sure!! Oh let me check it out and see what’s going on! I love a clean kitchen. I feel that if my kitchen is dirty, my whole house is dirty. I need to make a habit of cleaning it before bed each night. Your post has inspired me to get better at that! If feels so good to wake up to a clean kitchen! It’s inspired me to keep it clean during the day too! 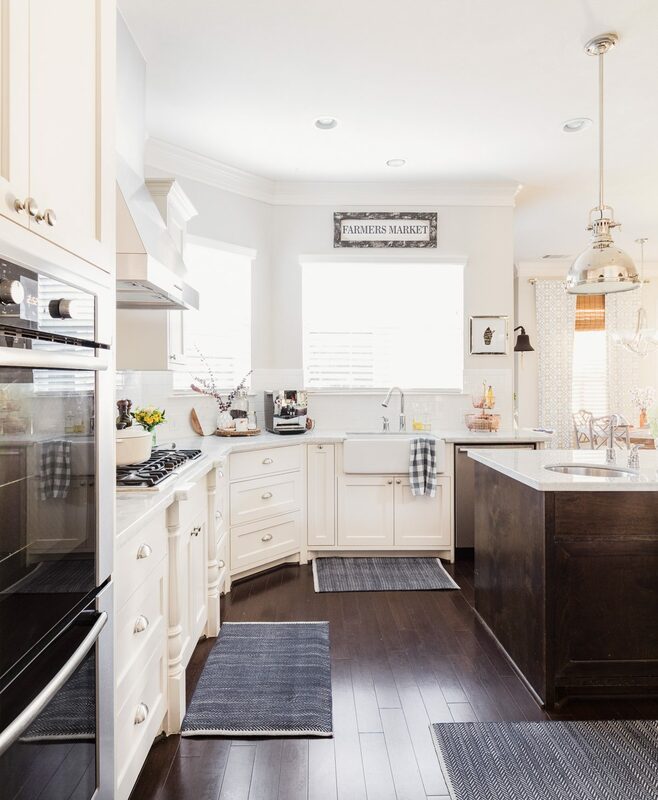 Where did you get your kitchen rugs? Love the recipe organization! Great idea! Hi! Those are from Dash & Albert- they are linked in the Spring Home Tour post! Hi, I love these type of blogs. Love a clean kitchen and that wallpaper. I also follow Jen on How Jen Does It. You two have a lot in common. I just found her recently, but love her channel! I’ve followed Jen for a few years – since she was in her old house. She’s amazing. Such an inspiration on so many levels! I love your random posts. That wallpaper is so pretty! Would love your thoughts on losing weight (but not necessarily on the level of training for a competition). everything is really interesting, thanks for sharing! 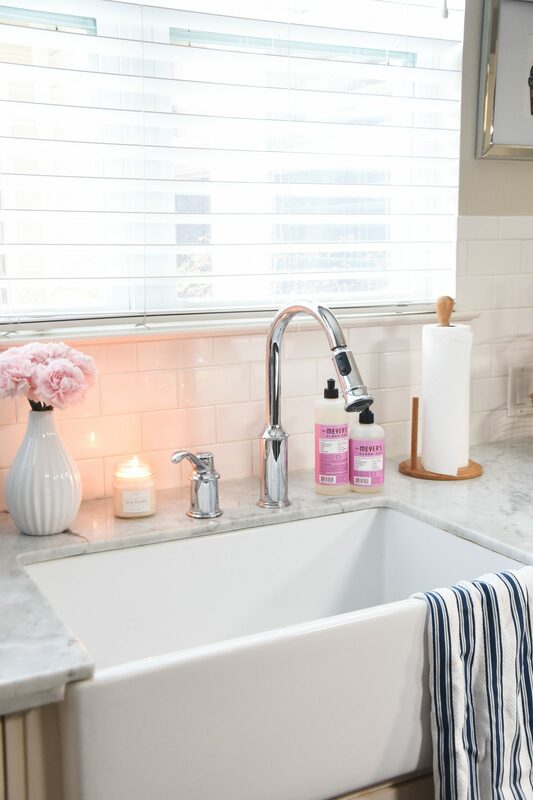 What cleaner do you use to clean your marble countertops? I’m always hesitant to use different cleaners on mine. Thanks! 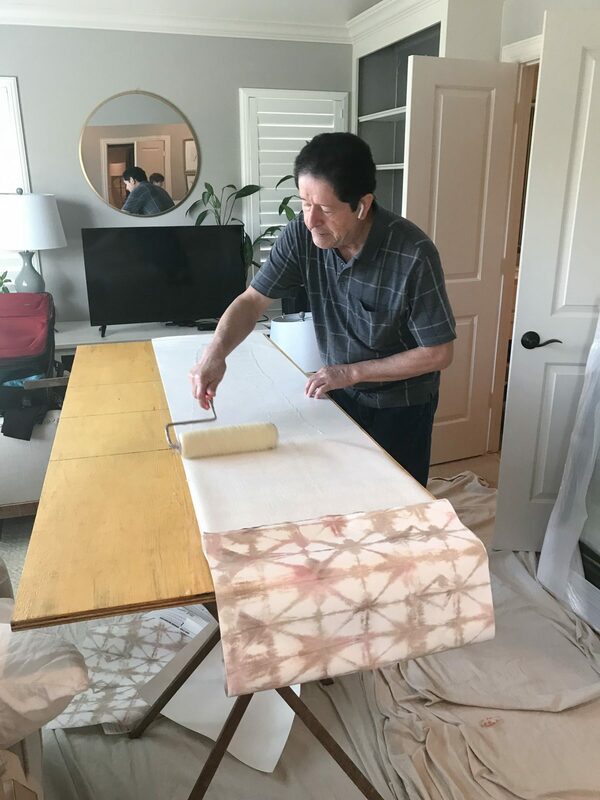 I’ve been using the Mrs. Meyers multi-surface cleaner with a soft cloth. I love this and will definitely be looking into Grove! We live 30 minutes from any decent shopping, so I’m all for door service! I noticed how shiny your stainless steel is. How do you get it so squeaky clean and finger print free!? Oh that will be super helpful! I’ve been using the All Purpose spray with a soft cloth. It does the trick, but I have to wipe every other day! Little fingers! Great inspiration! I have Same vacuum. How do you clean yours? I haven’t found instructions for best way to take apart and clean. Hi Janice! I haven’t had to clean ours yet! I was thinking the cleaning instructions would be online, but the customer service is very good if you give them a call. I love posts like this because we all get stuck in a rut and its so inspiring to see how others might do the same thing but in a better more organized effeicient way! Thank you! I watched a few How Jen does it videos and she has some good tips! Q, Do you know where you got your navy rugs in your kitchen? Thanks! Gorgeous wallpaper😍 Can you share your installer contact information? 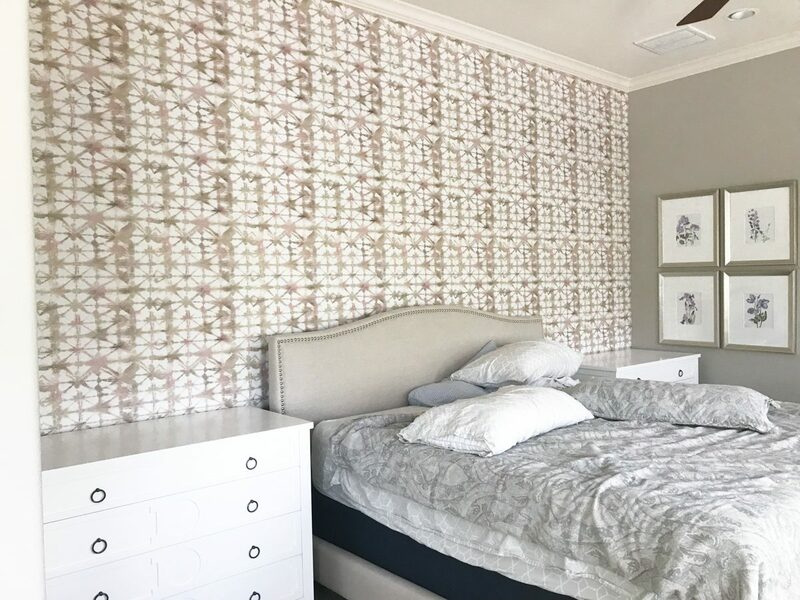 Loving the bedroom update, I live in League City , I was wondering if the price was fair for the professional wallpaper installer? And could I get his contact info? How does your dyson so I’m carpet? I was thinking about getting one and wondered if it could be used for the whole home. I use mine only downstairs on our hardwood floors and rugs, so I’m not sure how it does on carpet. It’s my new BFF!